Although building signs are made to be as durable as possible, they can’t always withstand the different forces of nature. Especially if a sign is on top of a tall building, it’s constantly exposed to sunlight and gets the full force of the Santa Ana winds we experience here in Los Angeles. Front-lit channel letter signs are made in a way so the faces are attached with trim cap and are removable. This is just in case the face becomes damaged or the lights inside need to be serviced. CBIZ, unfortunately, lost the face of one of the “M”s on their MHM sign face during some high winds we had earlier this year. Initially, they were just going to replace the face of the “M” until it was brought to their attention that the new face wouldn’t match the others. This is an issue we run into quite frequently with existing signs. Whether the signs were made from a pre-pigmented acrylic, pre-pigmented vinyl, or digitally printed vinyl, outdoor signs will experience fading regardless of what they’re made from due to the sunlight that they are constantly exposed to. You’ve probably seen signs where some of the letters are a different shade from the others because the owner only replaced parts of a sign. This can look unprofessional and cheapens the look of your storefront or building. 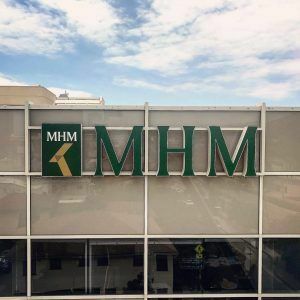 CBIZ was aware of this so instead of just replacing the face of the letter that got blown off, they decided to replace all of the faces of “MHM” and the logo box. A logo box is made the same way as a front-lit channel letter sign but the returns are shaped into a geometric shape rather than letters. With logo boxes, we usually digitally print the logo onto translucent vinyl and we lay it onto translucent acrylic. Since the letters needed to be a specific color, we also used digital prints for the letters. 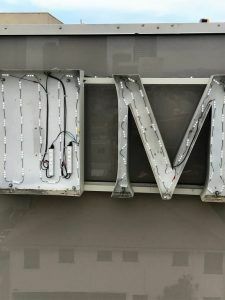 Since we were already going to be up at the top of the building, CBIZ asking us to convert their signs from neon to LEDs. Before LEDs came into the signage world, neon was the go-to for illuminated signs. Many businesses still have neon tube signs to give their storefront a vintage look but if the sign is internally illuminated, switching to LEDs will help you save money and be more energy efficient due to their lower voltage.